Glam Makes Big Cuts In Publisher Payments – "Up To 80% Drop In Revenue"
Advertising network Glam is putting an end to at least some of its guaranteed payments to publishers, just a month after raising an $85 million round of financing. Glam’s business model is to guarantee minimum flat payments to publishers. A medium sized blog will receive, say, a guaranteed payment of $10,000 monthly. Glam then sells ads into those blogs, and placed house ads with a high CPM for any unsold inventory. If the blog’s page views grew, those additional payments over the guarantee could really add up. Some publishers, with 3 or more ad units on a page, could guarantee a $15 or higher RPM (revenue per thousand page views). That’s an awesome advertising income for blogs, particularly blogs targeting women generally (highly specific niche blogs can command higher rates, but usually only at scale). So why is Glam doing this? Three reasons, probably. First, they need to get costs down. Last year the company lost $3.7 million on $21 million in revenue. They’ve promised investors that 2008 would bring in $150 million in revenue with $40 million in profit. The only way to get there is bring in a lot more publishers, sell a lot more ads, and keep a larger share for themselves. Second, Glam really needed to keep all those bloggers happy last year while they were raising capital. There’s no better way to do that than to send them big checks every month. Now that Glam has raised the big round, they don’t need the small bloggers at all, and they certainly aren’t going to be losing money on them. 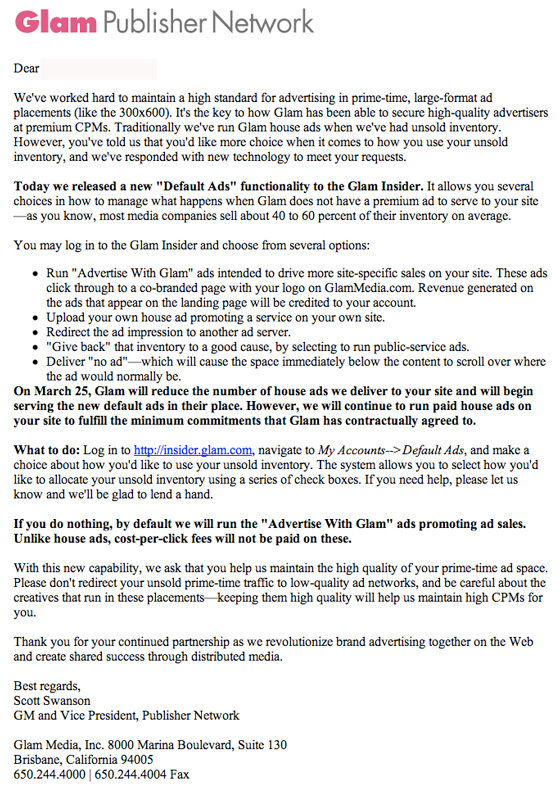 Third, Glam is actively acquiring many of the blogs that they currently sell ads for, and they want them cheap. By cutting their revenue dramatically and quickly, many of those blogs will immediately be in a very tight cash position. They may be forced to sell. And with revenues down, Glam can pick them up for a song. What does all this mean? It means if you are a Glam publisher, you’ve served your purpose and the good times are over. Move along, please. They have a company to build. And if you’re counting on those guaranteed payments after the termination date on your contract, well, you’re as dumb as Glam hopes you are. I’ve emailed Glam for a comment, but haven’t heard back from them yet. The company has raised a total of $114 million.